As of April 2017, we are proud to announce over $50,000,000 in Scholarships being made available to high school FIRST Participants involved in FIRST Tech Challenge and FIRST Robotics Competition! New providers are joining the FIRST Scholarship Program regularly, so FIRST students are encouraged to routinely check the FIRST Scholarship page for updates and information. 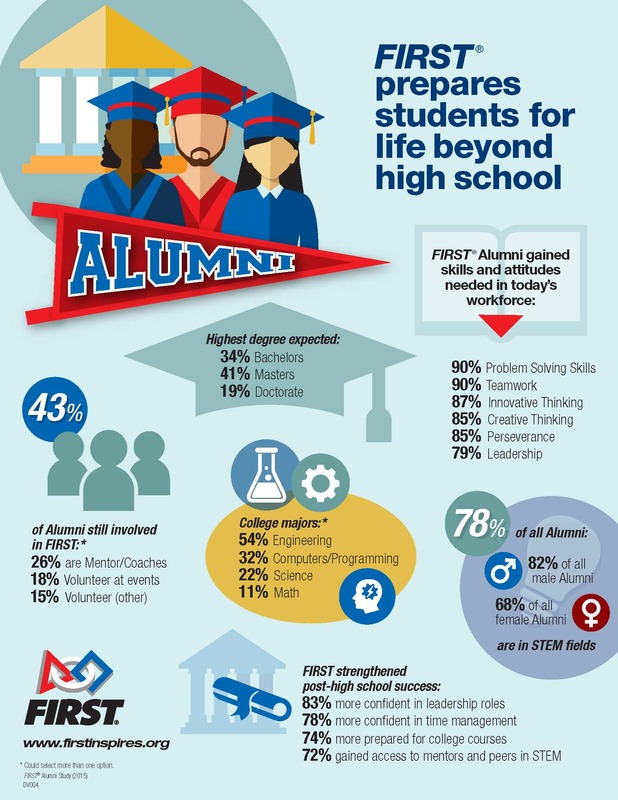 In studies, FIRST students have been found to be more likely to make a successful transition to college, to pursue their interests in science and technology and to become involved in their communities. FIRST program participation provides students with a positive experience in a challenging team activity that helps build relationships, teaches new skills, increases understanding of the value of teamwork, raises interest in serving others, and helps students gain a new understanding of and interest in science and technology. In recognition of high quality learning experiences FIRST students experience, several FIRST Sponsor Organizations are now offering Internships, as well.